Pawna Lake offers spectacular views too. It's about 15kms from Lonavala, is a beautiful,The areas around the Lake and the Dam can often be seen teeming with families out on a pleasantly sunny morning, enjoying the view and munching on the loot in the picnic basket. Trekking, Forts of Lohgad, Tikona and Tungi ostensibly visible from the Lake. 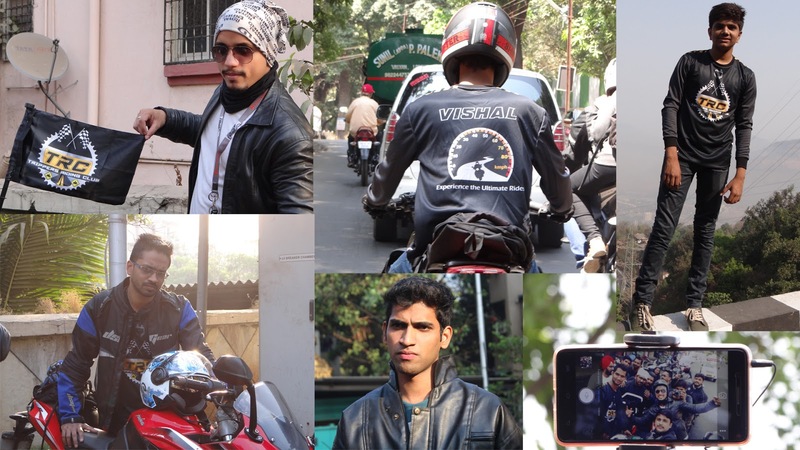 Voluntary Riders : Vishal, Govi, Akim, Rahul, Krunal & Sonu. Bikes : RS200, Classic 350, FZS, Hornet, Pulsar 220, Fazer, R15, Gixxer SF & Activa. 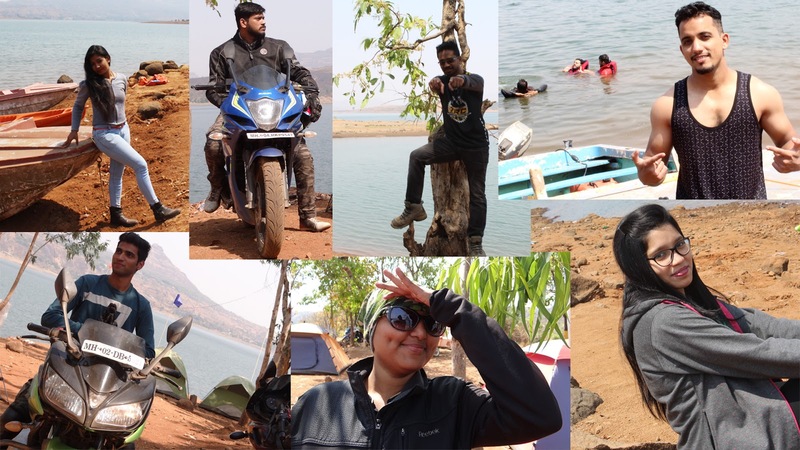 Hi Everyone, most of you must be knowing that we don't ride in summers and heat bombs struck Mumbai so early that we came up with plan of a short Spring Ride.Pawna Lake most of us haven't been there, just located 25km away from Lonavala. It's perfect place for camping as lake is surrounded by 2-3 forts. This lake can be explored from any point. Lohgad fort's end or Tung fort. Sweet "Albeena" & Rider Style "Saniya"
How we got here as usual 50% of riders don't sleep before ride coz of excitement and some with nocturnal nature. As said earlier this was short ride and we decided to meet at Assembly point around 7am. And flag off by 7:30am. Unfortunately most of the riders came around 7:20am and we started having light breakfast at Mcdonalds. We left assembly point by 8:15 which was 45 min late accordingly to our schedule. It was fine with us as we were just going for breakfast n swim at short distance. We don't allow scooties and motorcycles which are below 150cc engine. For short rides they are in. Khopoli is straight home stretch and we were slowing down from our standard speed of 80 to 45-60 coz of Scooty. Few kilometers away from Khandala we took halt coz our Marshal gave us call that Scooty is way more behind and they gonna take 15-20 min (as they were double seated). We asked his pillion to take seat on bike coz Activa won't be able to take up load of 2 people.... "Kyunki Khandala Ghat hai yaar.... dabb jaygi Activa"..
We reached Lonavala around 10:15 and we were voting how many people are feeling hungry, otherwise we would have directly taken breakfast at lake. Ram Krishna is best place for snacks. We took selfies and orphan kids approached Harmeet for money. I told them "kuch khane ko chahiye toh leke dunga, paisa nahi". They pointed out on tht shop "Baskin n Robins Ice cream.. What the.... U gotta be kidding.... I offered them local cup of Ice-creams for 80 bucks. Then gang of kids started gathering and I then I left by saying" 2 Ice-cream hai usme se mil baat ke khao". It was Grand Breakfast sponsored by Harmeet. For most of us it was 2nd Breakfast... Hahaa kya kare Bhuk hai nahi mitt ti. We did long and heavy breakfast followed by gags n jokes. "Kapil sponsorer ki bajaye jaraha tha" lunch bhi sponsor karne bol raha tha hahaha. Table Handler tak ko bhi nahi choda. Pranil was feeling sleepy. "ghadi ghadi aankhein mal raha tha". Sonu, Harshal, Suman n Krunal started interacting with other members as it was their 1st official ride with TRC. After sipping watermelon juice n chai-coffee we winded up this session. "Pura 1 Ghanta Nashta Thuste rahe". After crossing Lion's point again we took halt for direction and we were waiting for Scooty (which was escorted by Marshal). It was slowing down the entire trail and breaking rhythm of riding. They appeared after 30 min. There was a left turn which will lead us to our destination for that we have to experience little off-roading of 9 km. I told them plz directly meet us to Pawna Lake. 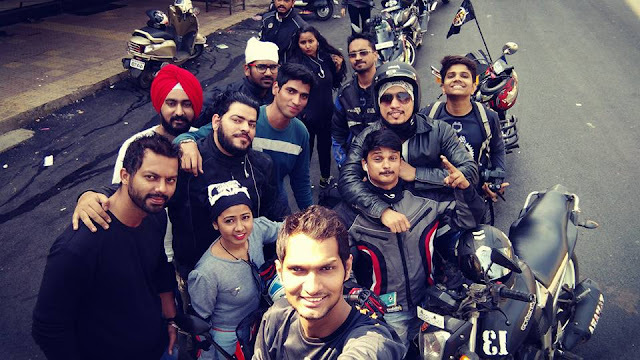 It was the least distance for us as we have already experienced 30 to 70km off-roading during Tapola and Bhimashankar ride. So it was not a big deal for us. Roads were narrow and dusty. Few places loaded with sand gave us feel of Desert Safari. Around 12:30pm we reached Pawna Lake. We saw group of 20-25 riders gearing up for return. We were happy to see that "abhi pure area pe apna hi raaj". Lake is surrounded by forts, fields and camping crews. We parked our bikes under shade and then without wasting time we headed towards lake for swimming. Suddenly sum1 shouted Sir yaha swimming bina life jacket ke allowed nahi hai". We had conversation with Camp guys, they told if anything happens to visitors in our radar then cops gonna catch us. If u don't want to take life jacket then u can take away your bikes from our property and swim anywhere u want to but not near our area. We told its fine with us, now we have already undressed and switched to swim wear, "kaun wapis bike leke aage jayga". 5 of us were armed with life saving jacket and rushed towards water. Rahul, Pranil, Harmeet and Govi went further and we found water is cooler and much cleaner then shore. Owaiz was happy without getting into depth. Rahul came up with idea of open race contest.. Why not Winner Was Rahul, Harmeet was 2nd as we was already exhausted few feet back. Spectators (Akim, Vishal, Kapil, Krunal) can't live with that, they grabbed life jackets and joined the splash party. Kapil n Vishal were afraid of getting into depth. "Baarat meh chaloge toh Nachna toh padega hi". We pulled and dragged them up to far distance. Life jacket hai yaar bindass maze karo... Free style swim, yoga style, play dead, reverse swim, float bla bla do whatever u feel like. Meanwhile Saniya & Albeena started with photo-shoot and Suman was taking some rest. Sonu & Harshal were chilling out and having some conversation. Rahul "Official Photographer of TRC"
TIME UP, TIME UP....Camp folks were informing us they provide Life jacket only for 30 minutes. One by one we came out like turtles. Ran straight for freshening up and to change wet costume. Sun rays were getting brighter and our throat was running out dry. All of us were very thirsty & hungry. It was almost 2:30 we decided to not to have any meals now just liquids or biscuits will do. Kapil called up and informed us that you guys can proceed without me and Scooty rider as Scooty won't be able to keep up with our pace. Akim had some commitments with family & Govi had an office, hence they left early with along with Vishal. After crossing Khopoli we decided to take the halt. We had fresh sugarcane juice, chai-sutta followed by a short round of intro & feedback session. After the 40 minutes refresher we headed towards our home. Believe it or not, this ride was beyond expectation. Open Lake Swim & Photo-shoot at Lake Placid changed everyone's mind. Another memorable ride added to our collection. We will Return in Monsoon with our next season of riding.